Lemon Ball sedum is part of a winter bouquet in this container with heuchera, lamium and pansies. Goldilocks lysimachia or Creeping Jenny resemble gold chains. Cool Wave Purple pansy and Cool Wave Sunshine ‘N Wine sizzle in this container with Lemon Ball sedum. Sometimes I am amazed at the sheer beauty of the cool season garden. The temperatures have pushed us a little closer to the fireplace the past few days but outside it is the ‘wonderful world of color’. Pansies, violas, dianthus, heuchera are just a few of the plants giving us a riotous show of color right now. My eyes however immediately go to the gold. 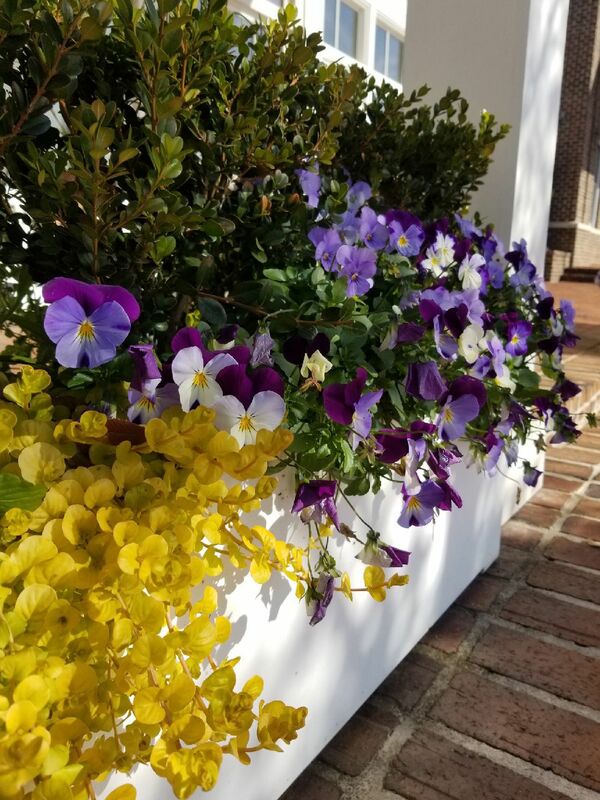 Mixed containers or landscape entrances that feature the pockets of gold or chartreuse, if you will, are the ones that seem to have everyone mesmerized. In Columbus Ga., right now, it is chains of gold from Goldilocks lysimachia, the Louisiana Super Plant award-winning Lemon Ball sedum, and the Golden Lemon thyme that are so riveting. Goldilocks lysimachia or Creeping Jenny is magical as during the summer it exhibits true lime green in the sun. You just can get enough as it hangs downward from baskets, window boxes and as spiller-plants in mixed containers. In the winter, however, once it is exposed to the South’s frosty nights it really does look like it is a chain that has been carved of gold. Plant it with violet colored pansies and the look becomes like nature’s sapphires on a gold chain. Goldilocks is a perennial in zones 3-10 really meaning that no matter where you live in the United States you have a season where it will be stunning. How stunning you might wonder, well, it won the ‘Knock Your Socks Off’ designation multiple times in the University of Georgia Plant Trials. It only gets a couple of inches tall but has a groundcover spreading ability. Golden Lemon Thyme is a little bit of a mystery plant. One has to wonder, why doesn’t everyone grow this plant. It fills the role as a spiller plant as well though it is more of a gently tumbling off the edge or rim of the container. It needs a sunny locale to get its golden color and, it’s cold hardy from zones 4-10 and reaches about 6-inches tall with a spread of 18-inches. As you are planting it, you will notice the culinary fragrance or aroma of the leaves that quickly tell you this will also be one for the kitchen. Golden Lemon thyme is heavenly in rock gardens or along stone paths. Keep your eyes open for the variety Archer’s Gold. Lemon Ball Sedum won the Mississippi Medallion Award in 2018 and Louisiana Super Plant Award in 2019. It is cold hardy from zones 7-10 meaning much of the South will find it a terrific perennial for mixed containers, rock gardens or along paths. It exudes a lush lime green that will turn gold in the winter. It also loads up with uncountable yellow flowers. Its foliage and soft needle-like texture, however, will have your eyes fixated. You can expect it to reach about 6-inches tall with a potential spread of three feet over the years. Goldilocks lysimachia, Golden Lemon thyme, and Lemon Ball sedum are the ultimate finishing touches to the cool season’s dazzling containers, baskets, or landscape beds, make sure you include them.